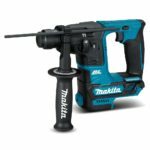 There were 3 new Makita cordless 12V CXT tools announced recently with the Cordless Vacuum LC08ZW, the cordless Cleaner LC09Z, and the cordless Inflator MP100DZ. All we have at the moment is their names, model numbers and one picture for each. The Makita 12V CXT Cordless Vacuum LC08ZW is a dust buster style vacuum cleaner with extension wand, floor nozzle and a crevice nozzle. It is similar to their previous LC06ZW model and looks identical. 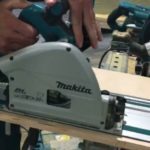 This could just be a model number refresh and it wouldn’t be the first time Makita has done this. It will be available this fall 2018. 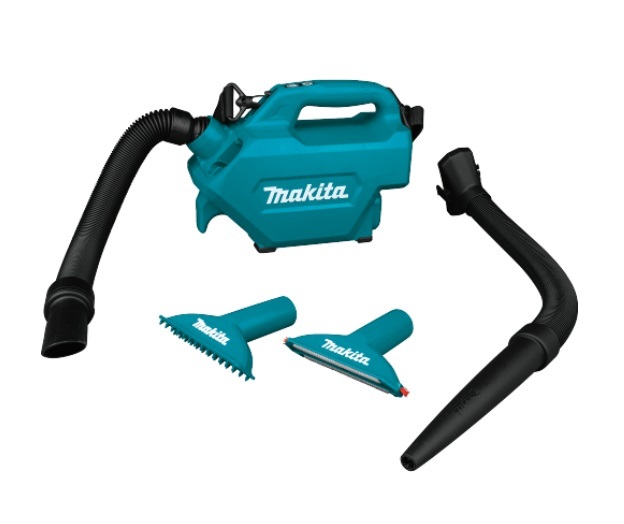 The Makita 12V CXT Cordless Cleaner LC09Z is an odd looking vacuum with flexible hose and blower function. It comes with two flexible hoses, two floor/utility nozzles and a fine point nozzle. Makita states this about the cleaner: A versatile cleaning solution for vacuuming in tight spaces. Includes a blower setting for added capability. It will be available in spring 2019. 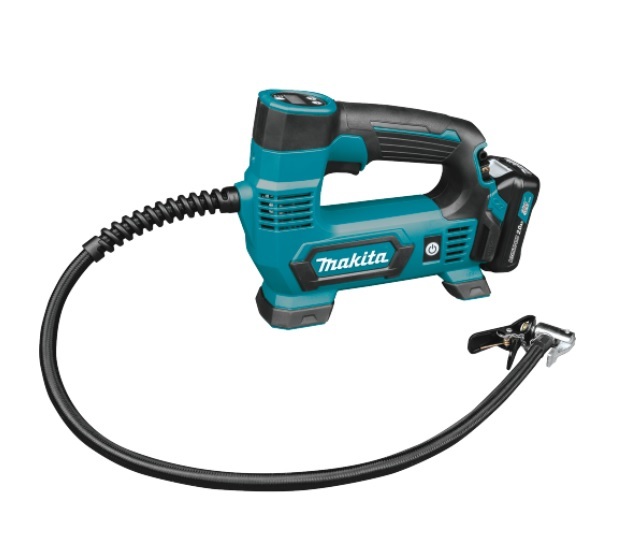 The Makita 12V CXT Cordless Inflator MP100DZ (also available as MP100DWRX1) appears to be a high pressure inflator for filling up tires on the go. It has a built in LCD panel and buttons to select PSI and a side mounted power button. It doesn’t appear to do anything else so don’t expect this to inflate your air mattress when you go camping. It will be available this winter 2018/2019. 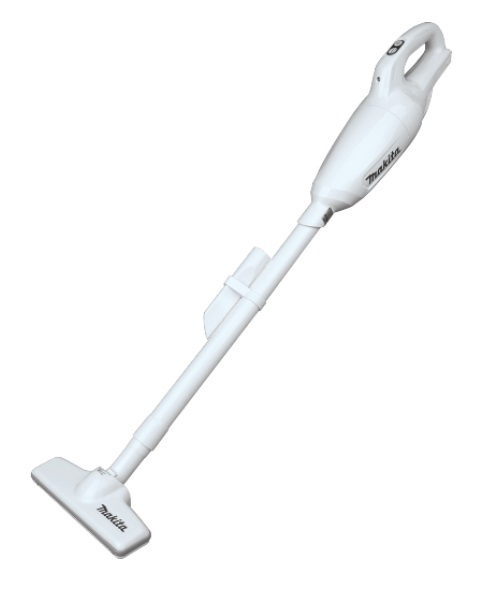 The stick vac looks to be the same as the one just released in Australia. If so, it is indeed an upgrade over the current model with increased suction and 3 speeds and a digital on off button rather than a trigger. Although I already have the M12 inflator I will be getting the Makita when its released to keep in the car. Also that vac/blower looks like it would be the perfect thing to clean up benches etc. So I will probably end getting one of those as well, lol! too bad Makita didn’t give us any specs to go with these yet. The inflator has just been released at $99AUD.